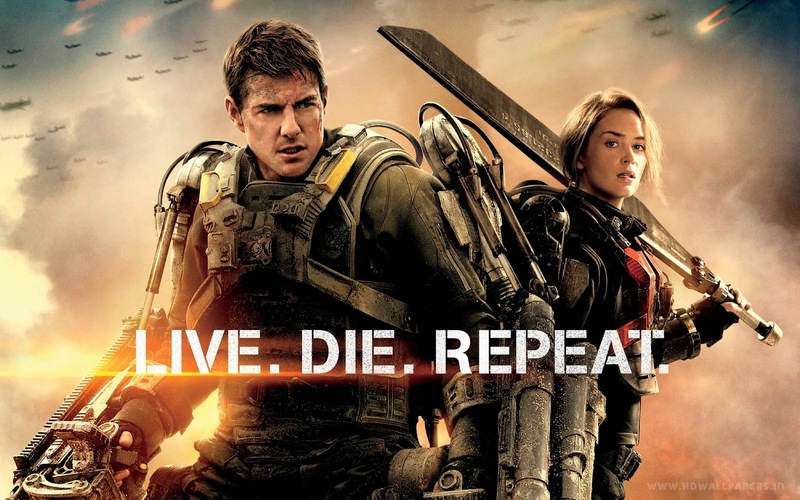 I watched Edge of Tomorrow yesterday at Silverbird Galleria. I thoroughly enjoyed it and wished it had continued past the point it ended. I really wanted to see what happened between Cage and Rita after Cage had successfully killed Omega and traveled back in time upon dying. But something else happened after the movie. Usually, upon watching an action movie at the cinema I feel a little high, like I can take on the whole world. Like I can be like the hero in the movie and do something really great with my life. This time around I had no such feeling. I only felt like I needed to use the restroom and go home. I didn't feel like I could do more than I'm already doing. For the first time in my life, I'm doing all I want to do. Everyday I feel myself growing. I have figured out exactly what I want to do with my life, what kind of life I want to live and what kind of business I want to build. On some days, I read from the moment I wake up till past midnight with just a few breaks in between. I'm learning business skills I wouldn't have realised their importance if hadn't quit my job. I occasionally feel my forehead aching; I hear it's the part of the brain responsible for the intellectual stuffs we do. I see it as the evidence that I'm working my mental muscles hard. And it's not like lifting dumbbells and weight bars, amassing useless muscle mass for show off. It's more like training like a soldier, for survival and real battles. All I read is purely for my survival and not to show off; not to sound intelligent during discussions or be able to pick arguments more frequently. Like a soldier, I have a strategy and everything I do is to aid me in perfectly implementing the strategy. Professional writing. I have bought a lot of books on writing and grammar. Last week I did a yearly subscription to AP Stylebook. And I wrote several editors at The Economist for advice on how to build my journalistic writing competence. If things go so well for me, writing will become what I do full-time while Excel and programming will become hobbies. This mean I will turn down any business offer that is outside these three, and I will avoid events and books that will not help me in actualising this strategy. And most importantly, I will develop my competency to a global standard level. I won't see the local competition as my model, I will pick the best Excel consultant in the world, the best indie enterprise web app developer in the world and the best professional writer in the world as my models. Right now, I'm doing writing and enterprise apps development at a hobby level and Microsoft Excel consultancy at a professional level. Soon, I will be doing enterprise web apps development and Microsoft Excel consultancy at a professional level, and the writing still at a hobby level. Then someday in the future, I hope to do the writing at a professional level, and the others at a hobby level. I'm doing my best in following this strategy and turning down many money making opportunities that I feel will derail me. I don't want to become successful at what I don't want to do. If I need to change my strategy, it would be because I have found a better one or that I have tried so hard at the current strategy without success. Not because I saw a quicker money making strategy. When you are doing your best you feel complete and no longer envy a movie hero. Whaooo, what a good and highly enlightening post!. I also do feel like that most times after watching some action or shylock holmes movie... I will take this away and meditate well on it "When you are doing your best you feel complete and no longer envy a movie hero." Thanks! Glad you like the post.